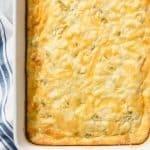 Green Chili Egg Casserole is an easy overnight breakfast casserole that is perfect for Christmas morning or any brunch occasion all year long! Preheat oven to 350 degrees. Butter a 9x13-inch baking dish. In a large bowl using an electric hand mixer or stand mixer, beat eggs until light. Add cottage cheese, Mexican cheese blend, butter, and green chilies. Mix until combined. Pour into prepared baking dish. Cover and refrigerate overnight or bake right away. Bake, uncovered, for 35-40 minutes or until edges on top are browned and center is set and appears firm. Cool 5 minutes before cutting and serving. The recipe can easily be halved and baked in a square baking dish or round pie plate for 25-30 minutes if you aren't serving a crowd. Recipe from my friend Cheryl.